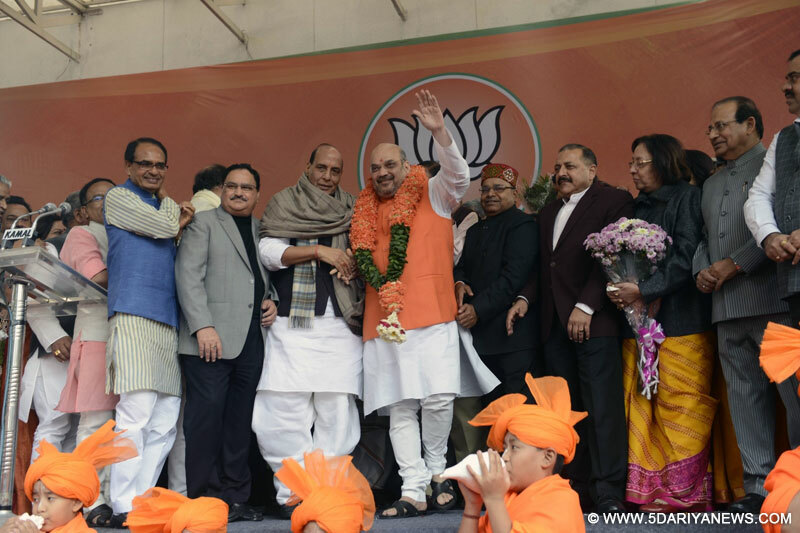 New Delhi: Union Ministers and BJP leaders Rajnath Singh, Jitendra Singh, JP Nadda, Najma Heptulla and others with Amit Shah after he was re-elected BJP president in New Delhi on Jan 24, 2016. Also seen Madhya Pradesh Chief Minister Shivraj Singh Chouhan. Amit Shah, a close confidant of Prime Minister Narendra Modi, was on Sunday elected the BJP president for a full three-year term, retaining the post he has held since the party took power in the country in 2014.Shah, 51, who took charge of the party in August 2014 from now Home Minister Rajnath Singh, was elected unanimously at a glittering event at the BJP headquarters attended by virtually all senior party leaders.As Bharatiya Janata Party leader Avinash Rai Khanna made the announcement that Shah has got the top post again, the packed hall erupted with joy, with young men repeatedly blowing conch shells and others raining flower petals on him.Hundreds of party activists cheered Shah and raised slogans hailing him and the BJP. Many garlanded or presented bouquets to Shah, who is seen as the most powerful man in the party after Modi.Modi was not present as he had to go to Chandigarh to meet French President Francois Hollande.But he congratulated Shah and said he was confident the BJP "will scale newer heights under his leadership". "Amit bhai combines grassroots-level work and rich organisational experience which will benefit the party immensely," said Modi, who is said to count Shah as one of his most trusted aides.Shah took hold of the BJP's reins from Rajnath Singh after the latter became the home minister in the Modi cabinet. There was no election then.Rajnath Singh said: "He (Shah) has been an extremely successful party president. I am confident the BJP will continue its forward march under Shah's stewardship and reach newer heights of success and glory." Another former BJP president, M. Venkaiah Naidu, said: "He is the most capable person. He has organisational ability, is a good strategist and is committed to (our) ideology. "Besides Modi, the two other notable absentees from the event were former party presidents L.K. Advani and Murli Manohar Joshi, who are known to be unhappy with Shah's style of functioning.Shah, who did not address the gathering or speak to the media, leaves on Monday to address a public meeting in Howrah in West Bengal, where the BJP will face a stiff challenge in its bid for power this year. The Congress was sarcastic. After pointing out the absence of Advani and Joshi from the event, Congress leader Kapil Sibal said: "Congratulations on his election, and congratulations on his future defeats. "A science graduate, Shah -- the son of a businessman -- rose to fame when he, as the party in-charge in Uttar Pradesh, led the BJP to a grand victory in the state in the 2014 Lok Sabha battle where it won 71 of the 80 seats. An ally won two more seats. It was the general election where he and Modi combined to lead the party to a spectacular victory, ending 10 long years of Congress rule.Shah moved towards the Rashtriya Swayamsewak Sangh (RSS) in Gujarat in his young days, and later took to student politics. He met Modi in 1982, and the two have remained close since then.He joined the BJP in 1986 -- a year before Modi did. A four-time legislator in Gujarat, Shah was a home minister in the state when he was embroiled in a fake encounter case.He was one of those who helped the BJP grow and grow in Gujarat, reducing the Congress to a pale shadow of its original self.But his reputation as a strategic organiser took a beating when the Aam Aadmi Party routed the BJP in the Delhi assembly election in February last year -- the first popularity test after the Lok Sabha polls.The BJP was again defeated in the Bihar assembly election in November 2015. It was the Bihar defeat that triggered a revolt by some BJP veterans including Advani and Joshi against Shah's working style.